baby | Live Cheap, Feel Rich! EarthBaby is a compostable diaper service started by two Bay Area dads in 2008. These dads searched high and low for a convinient and environmentally friendly alternative to disposable diapers. Though single use compostable diapers were available, no service existed to compost them – no matter what, they’d still end up on a landfill.. Disposable diapers constitute the 3rd largest contributor (by volume) to US landfill sites (based on 2008 data). EarthBaby is looking to decrease this volume considerably by diverting m ore than 16,000 pounds of diaper waste from Bay Area landfills each week by converting it to nutrient-rich soil. If you’re interested in trying one of these diapers, you can simply enter your information here to get a FREE sample. Unfortunately, this service is currently only provided for the San Francisco Bay Area, but if you are in this area, this is a wonderful cause that is worth trying. Nature’s One® is a pioneer in the organic medical nutrition category introducing the first organic baby formula to the United States in 1999 under the brand Baby’s Only Organic®. From day 1, Nature’s One® has heavily invested in research and development to offer the very best in organic and nutritional science. The products are sold nationwide and internationally through a wide range of retail outlets and medical suppliers. Nature’s One® is giving out free samples – a complimentary can of Baby’s Only Organic® or PediaSmart® products. A $5.95 shipping fee applies to these two products. If you prefer to try PediaVance®, this ships FREE! You can see the full list here and see what is best for your needs. Once you select your product, you simply complete a quick survey. Once completed, you will receive a coupon code at the email address provided. This code will be available for use through NaturesOne.com. Hello to all my new mommas! I have a great deal for you: a free baby sling of your choice, pay shipping only. Made by mom, Jenny Pierce, for moms, you know that you’ll be getting exactly what you need in terms of comfort for you and your child. These slings are not only beautiful (check out all the patterns!) but they’re comfortable as well – made with 97% cotton and 3% lycra – they won’t lose shape over time. These are perfect for infants to toddlers up to 35 pounds and are entirely machine washable. Fill in information + billing details and pay only shipping. Also – hot tip, you can use this code more than once for the same address! Nice. Let us know how you like the sling! Immediate question: WHAT IS KINDERMUSIK? Kindermusik is a class for children newborn up to 18 months old. You can search for Kindermusik classes near you here. You can find individual teachers here. Kindermusik firmly believes that a solid foundation of basic musical training at a young age is the best path for children. Instruction begins with basic, essential concepts like steady beats and motor skills. And here’s where you guys come in – you can try a free class before you join to make sure that this is something you’re interested in for your child before you pay for the real deal. Benefits of Kindermusik include those that are social/emotional, it assists with language and literacy, cognitive functions, a long term interest in music, and physical. I think this sounds like an awesome idea – and honestly, I wish this was around when I had children this young. If nothing else, this is a fun activity to do with your baby that you can feel good about – a great foundation for positive habits. Click here to set up a free class and try this out soon! I won’t lie, I’ll enter any sweepstakes I see – the more you enter, the more your odds are of winning SOMETHING. This is a pretty good one. DisneyBaby is running a sweepstakes called ‘Capture the Moment Sweepstakes’ where all you need to do is enter between August 4th and August 30th and you could win 1 of 4 portrait & prize bundles worth up to $500 each! Unfortunately, I didn’t find this until August 20th, but if you enter you are still qualified to enter for the Weeks #3 and #4 Sweepstakes, Disney Princess and Mickey Mouse, respectively. Each winner will get a $300 family portrait package from Target Portrait Studio and a Disney Baby prize bundle that’s worth up to $200. EVERY SINGLE PERSON WHO ENTERS gets a FREE Portrait Package Offer which includes a free 8×10 portrait and sitting fees – a $40 value. Not too shabby! Have you ever heard of a belly band? Me either, until about 30 minutes ago. I wish these existed when I was pregnant with any of my kids! A belly band is a band that allows you to STOP BUYING maternity pants and spending money on in between sizes during your pregnancy. It simply is a tight band that you put around unbuttoned pants – creating a seamless look and coming in several colors – just looks like you’re wearing a tank under your shirt! I’d have certainly been willing to try these out in my pregnant days, especially for free! Here’s how you can get 2 FREE BANDS with a promo code – all you need to do is pay shipping (which can be between $12-$14 depending on where you live. Not too shabby considering that they retail at $28 apiece. Choose two colors of the belly band and add to cart. Scroll all the way down to your cart and use promocode: BAND4FREE ($40 will be taken off). That easy – enter your shipping information, pay for shipping, and you’re good to go! Try this out, let us all know how it is! 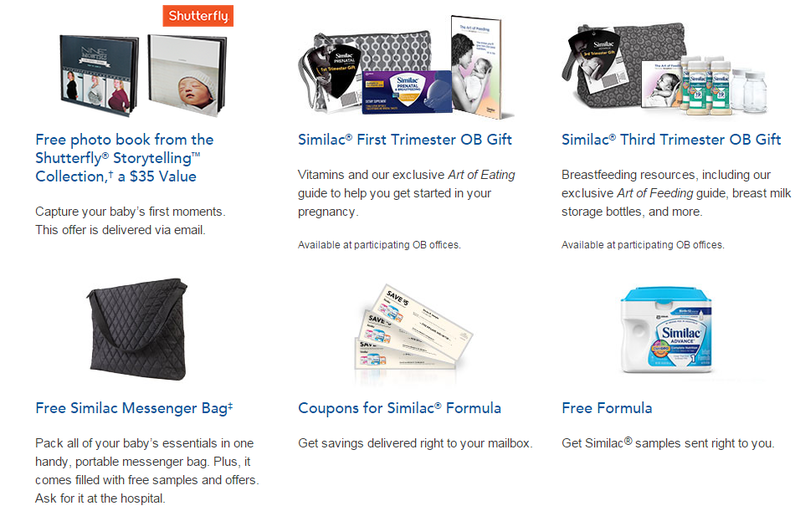 This is a really legitimate promotion from Similac®. They offer a free membership to Similac® Strong Moms®, a club that gives users nutrition guidance and feeding help for every week of your pregnancy all the way through your baby’s first year. I so wish I had this as a resource through my pregnancies. They advertise that you can receive up to $329 in benefits, from free formula, to messenger bags, to trimester gifts! In addition to all the free swag, you get nutritional guidance, tips to get ready for child birth and breastfeeding, emails about baby growth and development, and live nutritional support from their FeedingExpert team. Sounds like an incredible resource for mommies to be! Sign up here to be a part of this community!